Andy and Clara Anderson ran a steam sawmill on Powell Lake at Block Bay from 1932 until the 1950s. When the lease there ran out, they moved the sawmill to their property on Mowat Bay, but could not get a city licence to operate it. They donated the sawmill to the Burnaby Museum, but it was not displayed. Burnaby decided to divest itself of the sawmill and offered it to the Powell River Museum. 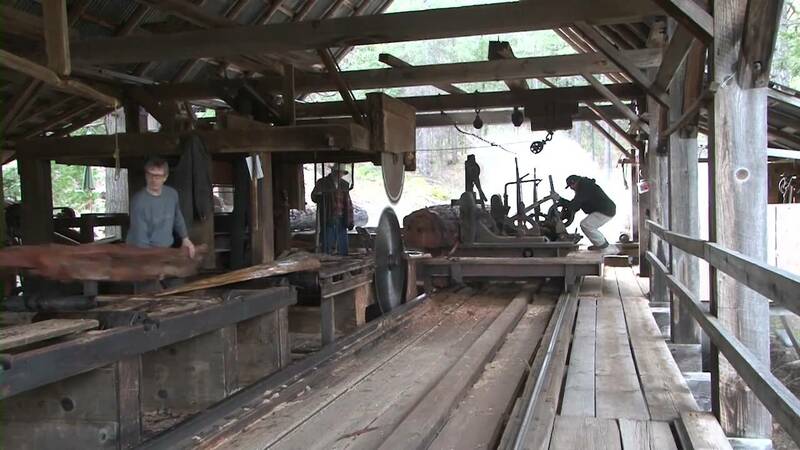 Equipment includes the 7' x 90' sawmill itself and the associated Steam Donkey. Siting is not fully resolved; one site under consideration is on the grassed land between Hwy 101 and the south end of the Mini-Putt. Founded as Armstrong & Morrison, Ltd., the works was bought out by English interests in 1901 and the name changed to the Vancouver Engineering Works. The plant was located at 519 6th Ave. West Vancouver, BC. All that is known about the donkeys produced by this firm is that they were very similar to those of the Puget Sound Iron & Steel Works. The Labour Gazette of November 1902 stated that Albion Iron Works of Victoria and the Vancouver Engineering Works had a total of nine donkeys under construction at that time. In Canadas Resources and Possibilities by James Stephen Jeans (1904) the author describes one of these donkeys The largest of these engines, one of which had just been completed at the time of my visit, has a 10 in. cylinder by 15 ft. (sic) stroke, carrying a boiler 131 in. long by 60 in. diameter built of 7/16 in. plate. Two drums are of sufficient size to take on and one-half miles of 7/8 in. wire cable, to cover the long distances over which logs have to be pulled. These engines and smaller ones fitted with every device for the combination of lightness and strength, are used in nearly every logging camp in the country-to the displacement of the horses and bullocks formerly employed. Donkeys were produced as late as 1927. The firm was still in busyness in the mid-1950s. This firm was founded May 4, 1863 as the largest machine shop and engine builder north of San Francisco. The plant was located at the corner of Store & Discovery Streets. An advertisement in the Guide to British Columbia for 1877-8 lists Albion as building hoisting engines. The Labour Gazette of November 1902 stated that Albion and the Vancouver Engineering Works had a total of nine donkeys under construction at that time. The only known surviving donkey by this builder is now on display at the Canada Science and Technology Museum in Ottawa, Ontario. In 1902 Albion was merged into Victoria Machinery Depot. The company was best known for its marine work and domestic stoves. "An Albion Iron Works steam donkey was used to clear the townsite of Powell River by Amandus Anderson in 1923, Last used 1951. Photographs were taken at Mowat (sic) Cove, Powell Lake, before the donkey was shipped to Ottawa, for the National Museum of Man Collection."